After leading Michigan State to a win in the Rose Bowl, Morrall was taken in the first round of the 1956 NFL draft by the San Francisco 49ers. Following a mediocre rookie season in which he backed up Y.A. Tittle, he was dealt to Pittsburgh where he became the starter and had a fair year in ’57. Two games into 1958, he was traded to Detroit in the deal that brought Bobby Layne to the Steelers and for the next seven years he shared the job with, first, Jim Ninowski and then Milt Plum. His best season with the Lions was in 1963, when he passed for 2621 yards and 24 TDs. But when new Head Coach Harry Gilmer committed to Plum for ’65, Morrall was dealt to the New York Giants. He started in 1965 and had a good year for a 7-7 team, but missed half of ’66 due to injury and was on the bench behind Fran Tarkenton in 1967. Frustrated at once again being a backup, he was traded to the Colts during the 1968 preseason to provide insurance as number two to Johnny Unitas. When Unitas suffered a major arm injury, Morrall took over as the starting quarterback and had a MVP season, most notably leading the NFL in passing, TD passes (26), and yards per attempt (9.2). The Colts went 13-1 and won the league title, although the dream year came to a sour end in an upset loss to the AFL Champion Jets in the Super Bowl. Morrall returned to a backup role with Unitas reclaiming the starting job in 1969 and helped rally the Colts in relief in the Super Bowl win over the Cowboys following the ’70 season. He saw considerable action in place of the increasingly-brittle Unitas in 1971, but with the team undergoing a youth movement in ’72 he was traded once more, this time to the Miami Dolphins where he was reunited with his first coach in Baltimore, Don Shula. A broken ankle suffered by starting QB Bob Griese in Week 5 put Morrall in the starting lineup. Dolphins went 14-0 to finish first in the AFC East as they led the NFL in total yards (5036), rushing yards (2960), scoring (385 points), and touchdowns (45, tied with the Oakland Raiders). Won AFC Divisional playoff over Cleveland Browns (20-14), AFC Championship over Pittsburgh Steelers (21-17), and Super Bowl over Washington Redskins (14-7). 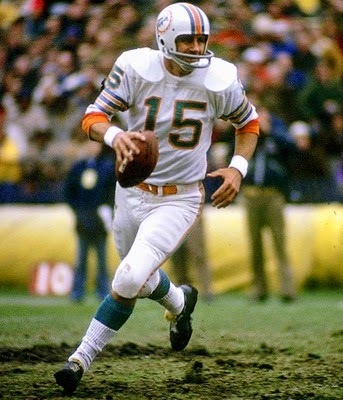 Morrall gave way to Griese in the playoffs in 1972 and stayed on another four years as a backup, finally retiring following the 1976 season at age 42 and after 21 seasons in the NFL. Often regarded as the greatest backup quarterback in league history, he twice was selected to the Pro Bowl and ended up passing for 20,809 yards and 161 TDs.